So last weekend, and this is a much belated entry - was GenCon SoCal. I went because once again La Sangre de Los Angeles was running an event there. This year I was determined to actually DO stuff though, and I did, and it was a lot of fun. On Day one I entered a "World of Warcraft" card game tournament, in which I was roundly whipped by young children and old ladies. When you say "whipped" like that, you have to pronounce the "H" first, and emphatically in order to express just how poorly I did in that tournament. I did get to keep the cards I opened at the event though, which was sort of my whole point. That night joemorph and I tied one on, mostly by accident, and were truly legless by the time his basically unamused girlfriend got home. Day two, I entered the Vs. system Pro Circuit Qualifier - again mostly to get the cards you get to keep. I've resisted the lure of CCG's for years, but daogre and scottgardner got me hooked. I ended up doing tolerably well in the tournament too, but the combination of my brutal hangover (reference earlier leglessness) and a couple of rookie mistakes cost me some matches. Also, I'm pretty sure one guy was cheating - though didn't make an issue of it at the event. One high point of the weekend was getting to meet Richard Hatch - the original Apollo on Battlestar Galactica, and the current Vice-President Tom Zarek. He was shilling for The Great War of Magellan which he wrote and directed, and apparently is debuting - in concert with a related gaming event - at .. uh, either Gencon Indy or Origins. Anyway, I finally couldn't resist my fanboyism anymore, and posed for a picture - which broke the dam, and then the floodwaters of fanboys jumped in with me. Now that I'm thinking about this all in one place, there was a lot of embarassment for me this weekend. Not leastwise because I appear to be some sort of beached cetacean in this photograph. The rest of the weekend is a bit of a blur, between running around getting ready for our event.... and recovering from earlier excess just in time to utterly outdo it by bringing (and consuming!) a bottle of Rumpleminze - aka - "copkiller" to the after-game party. I vaguely recall randomly throwing a painful wrist-lock on joemorph,and then, in order to clear the room, stripping on the bed. No one wanted to see that, least of all me. In my defense, it was my hotel room, and it was 4am, and I really did want them to get the hell out. However, there's a reason i've avoided copkiller all these years, and it has a lot to do with WHY we call it copkiller. I humbly apologize for my wretched, filthy excess that night - and especially for various drunken text-messages and phonecalls. Other than the hungover haze that I checked out in, managed to lose a very valuable deck of Vs. cards, fought in a "boffer" fencing tournament and was unjustly beaten by a cheater, and an espionage game in which I might not have won, but my team thoroughly obfuscated the solution for everyone else - so hey, it's a sort of victory. Or something. GenCon was a ton of fun this year - moreso than last. They do get you coming and going in terms of your pocket book though, dang. It sounded magnificant. I cant at all relate to random nakedness. well I kept my shorts on! Damn, sounds like I missed out on a lot of fun. I need to make time for a road trip to LA soon! For some Zankou Chicken, Hawaiian barbecue, and Charly Temmel ice cream. Funny how the only things I miss about SoCal are the edible things. Yeah, I was making a list of things I wanted to show to ironsides99 when he visits (aka The Hobbit) and... well, it was pretty much all places to go to eat. Well let's see this list! There's two weeks from the time I get back from Ohio until classes start, and I have nothing to do! Food may be "on the menu" as it were. and we thank you for the keeping of the shorts on. but I did have a much better time this year than last. This is true. Great party you threw, even before the pants came off. Great party you threw, even before the pants came off. You'd be surprised at how often I hear exactly that. 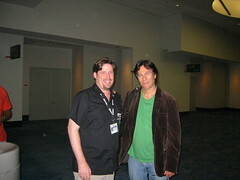 I'm 99% certain that I roomed next to Richard Hatch at Comicon just gone. Wild parties? Strange noises, like wildebeests? looks like a fun time, what goes on at GenCon? never been to one yet. It's all gaming fun, non-stop. Sounds like a lot of cheaters? What was this espionage game? That sounds interesting. You also said you were getting ready for an event? What event was this? An OWbN game? What's that? the espionage was a series of puzzles you had to solve in order to get "hired" as a secret agent. They ranged from finding someone in the lobby with a suitcase and asking her for a codeword, to storming a dark room with lazer-tag guns to disarm a satellite sensor. It was fun! I ran (with lots of help) a two-night One World By Night live action game. OWbN is a network of live-action games across the world. It went pretty well - and got pretty hectic, but in a good way. The espionage thing sounds awesome! Lazers make everything better. OWbN is the Vampire Larp? I didn't realize it was so organized now, with an overarching story. Neat! What hero did you play in WoW? What team did you play in Vs? My roommate just got 3 starter packs for WoW. Unforunately, Starter decks are random! You can't tell what hero or even what faction you're going to gfet, until you open the box. He ended up getting 2 of the same Hero. Stupid WoW ccg. In the WoW tournament, I played a dwarven priest deck that got roundly housed. But your friend is actually lucky - having two identical starter decks means you can put together one good deck, because you get multiples. The starter decks are really weak. In Vs. I put together a kree and Heralds team. It was fairly weak, except that I did have firelord, and 8 pt. Thanos, which meant on turn 6 I could dish some heavy, heavy damage. What tripped me up was that I failed to pick the initiative every time, so I couldn't pick evens.